Turkish Dogs - particularly Anatolian Shepherd Dogs: Getting started! As if I have time for another project... but I'm always interested in learning something new so I think this will be an area of infrequent updates on various things, particularly about my interest in Anatolian Shepherd Dogs. 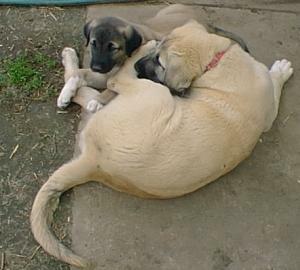 Some beautiful Turkish collars for these big dogs can be found at Andrea's Taking My Time webpage. Some pretty nice beaded collars and really impressive looking spiked dog collars. Check them out!